A 3 bedroom cottage which accommodates up to 6 guests. It has a large kitchen, dining room, and large lounge. Accomodation is all on the ground floor. Lounge and dining room each have french doors onto a patio area with patio furniture, and a charcoal barbecue is provided. Ample off-road parking for 4 cars. 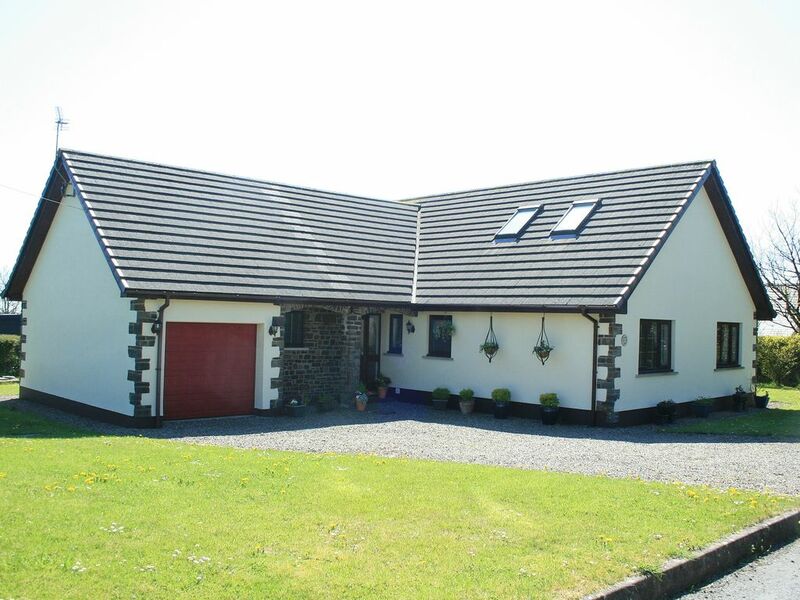 The cottage is in a quiet cul-de-sac in a sleepy village, a haven of peace and quiet, within a very short drive of several of South Pembrokeshire's best beaches and family attractions. Geoff and Pam Lloyd are the owners of Ty Gerllyn. We built Ty Gerllyn as a retirement project back in the 90's but have decided not to move to Pembs in retirement. We are two NHS professionals now retired after 40 years in the NHS and currently live in Cardiff. Pam worked as a Radiographer at the University Hospital of Wales, and Geoff as a Biomedical Scientist in the Medical Biochemisty department of the same hospital. Family bathroom with bath, wash hand basin, wc and separate shower cubicle. The property also has a second separate wc and wash hand basin. Beds are made up on arrival. Garage is not included for child safety reasons but there is adult access for electric fuse box and barbecue. Possible to use for bike/canoe storage. Free WiFi is available at the property. We now have fibre so speed is much better for streaming purposes. Hand and bath towel for each person. Beach towels are not provided. BT Wireless internet (fibre) is available and free to use. Login details available in the property. Large lounge with 2 leather sofas. Freeview TV and DVD player. Roku streaming box provided which provides access to CatchupTV and Netflix etc. Adjoining dining room. Basic supply of dishwasher tablets provided. Welcome pack with tea, coffee, sugar, milk and Welsh Cakes. Filtered water is available from separate tap in the utility area. Large kitchen equipped with electric oven, gas hob, microwave, kettle, toaster, coffee filter machine and fridge freezer. Freeview channels and Roku streaming box which gives access to CatchupTV and OnDemand, Netflix etc. Some board games and puzzles are available. Patio area with table, umbrella, and 6 chairs. There are golf courses at Haverford West (approx 20 minute drive) and Tenby. A golf facility is also available at Heatherton Activity Centre (near Narberth). Narberth Swimming Pool is 3 miles away and is available for public use - please see schedule at www.swimnarberth.co.uk Bluestone Blue Lagoon All Weather Water Park is a 10 min drive away. Notes on accommodation: Out of main season short breaks available. Please ring to discuss. NB: Please note that we are not able to accept pets. Outside: There is a large lawned area to the rear and sides of the property. At the rear is a patio area with large patio table/chairs/umbrella and BBQ Utility Room: Utility room has a sink and washing machine, dishwasher and tumble dryer Cleaning / Towels / Linen All linen and towels (except beach) are provided. Thank you for your kind review. Glad you enjoyed your stay and hope to welcome you for Ironman2019. Well equipped spacious bungalow with a large garden. Close to several beautiful beaches and plenty of local attractions. Perfect base for all weathers. Will definitely be going back. Very clean and well catered for. Had a very pleasant weekend stay...6 of us stayed and the cottage was plenty spacious for us.very clean upon arrival...the owners are really nice and helpful from the moment we booked. Set in the countryside...only a short drive to sandersfoot or tenby.overall we were happy with our stay. Lovely accommodation. We had a fantastic stay & the bungalow was absolutely great. Excellent property, very spacious and very clean!! The property is located in a quiet area but there are surrounding properties which is great for security. Our only recommendations would be to have gates at side of property for security but also to prevent children running out onto to the road. Also, to have a baby gate at the bottom of the stairs, thankfully my toddler never attempted to climb any stairs. Also, if you ever think of changing the bath to include a hose which would be ideal if there are young children staying - as we had to use a jug. Other suggestion would be to have blinds in the lounge. Overall we enjoyed our stay here at the property. A car is essential as there is no public transport through Ludchurch. Nearest transport hubs are Kilgetty and Narberth where rail and bus are available. Kilgetty 5 miles. Small town with supermarket, takeaways, railway station and bus hub. Tenby. The well known seaside resort of Tenby is only 8 miles away. Saundersfoot. Seaside resort some 5 miles away. Oakwood Theme Park and Bluestone Aquadome are an easy 10 minute drive (7 miles) away. The local caravan park (Woodland Vale) - approx 200 yards - has a clubhouse. The restaurant and evening entertainment can also be used. Booking Notes: A deposit of £100 is required at booking and the balance due 6 weeks before the holiday. Changeover Day: Changeover is Saturday for weekly guests. The property is available from 4pm, sometimes earlier depending on cleaning. Possible to drop off luggage after 11am. For 3 night weekend changeover Friday. For 4 night mid week on Mondays. Notes on prices: Discounts available for underoccupancy. Please ring to discuss. 3 night and 4 night short breaks available out of season. Please ring to discuss. Daily rate of £100.